Mudhirapuzha, Nallathanni, Kundaly these three rivers are flowing over this peak station to fertile the land of Munnar. In Malayalam munnu means three and aru means river that how Munnar got this name. In each part of Munnar is being unique because of it different landscape. Munnar is completely covered with green velvet that is the most mind blowing sightseeing. Periyar wildlife sanctuary is the major tourist attraction in Kerala. This is a thick forest is reserving different verities of wild animals. Already the Periyar wild life sanctuary declared as the tiger reserve area since 1978. The jeep safari in middle of forest is the adventure activity in Thekkady. By jeep safari we can be victim to watch the wild animal in the wild forest. When we travel over the Periyar River by the boat we can see many wild animals besides river. The Arabian Sea is lying behind the culture and history of Alapuzha district. First and foremost blessing of Arabian Sea is the brackish lagoon. That blessing has changed the fate of Alapuzha, past days the civilians were used the backwater for their fishing, transportation etc. But now backwater tourism is the major attraction of Alapuzha. Every year thousands of tourists are flowing into this land to sip the beauty of nature and houseboat trip. Alapuzha is the best way to touch the nature and feel the nature. Kerala’s biggest waterfall is the Athirapilly waterfall; water is flowing from the 80 feet of height from the sholayar rainforest. From that itself we can understand how much big it is. The surrounding area of Athirapilly is fully filled with roar sound of waterfall. Athirapilly waterfall is the king of other waterfalls in Kerala. It’s proudly and richness is being out of imagination of human being. The goddess Kanya Kumari is the sister of Lord Krishna, that’s how this place got this name. The word Kanya kumari means young lady same as the word meaning Kanyakumari is always being as a young lady. 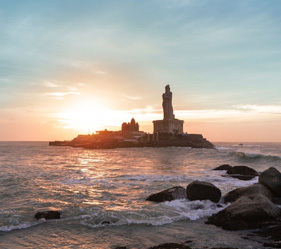 The beach of Kanyakumari is cleaning its sea shore in every second. As a traveller we can feel the sadness of beach at the time of separation of sun from its hands in the morning. And the happiness of beach at the time of holds the sun in the evening. When it comes to tourist destinations in Kerala, Trivandrum is one of the famous tourist destinations in Kerala. It is the capital city of Kerala and thus home to the most of the major governmental offices in Kerala with busy commercial centres and low coastal hills, sprawling beaches and pilgrim centres. 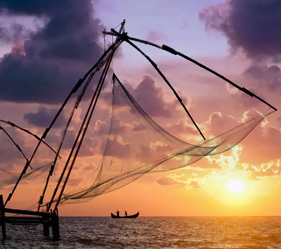 Trivandrum is the small-scale of the entire state of Kerala because anything you can find in the rest of Kerala can be found here, for instance amazing hill stations, beautiful backwaters and beaches, wildlife sanctuaries, lagoons, etc. On top of these, Trivandrum has another unique feature that the most reputed place in India for medical tourism. . The Malayalam “vayal” means paddy field and “nadu” means land that’s how the district got this name Wayanad. This land is only district is sharing its border with Karnataka and Tamilnadu. This heaven land is hollowed with thick green forest and peak stations. No words to say much about Wayanad that much beautiful of sightseeing includes surrounding area of Wayanad. The atmospheric condition is also suitable for the people who like to enjoy the cool climate. To adore the summer holidays Wayanad is the best place than the other districts of Kerala.